A good, hardy set of dining chairs will stand the test of time, surviving clambering children, spillages and raucous Christmas dinners – invest in a classic set, whether for your period home or traditional-style dining space, and they may even become a family heirloom, passed down for years to come. Whether for a (gasp) separate dining room, for kitchen table suppers or chichi soirées, these are the best traditional dining chairs for style, practicality and comfort. 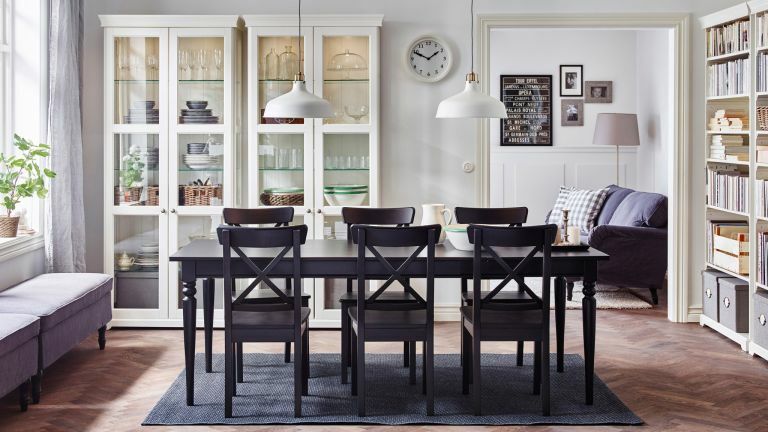 Choose the best dining furniture with our practical how-to guide. The Hudson dining chair is curved and padded with foam for top-notch comfort, and although the silhouette is certainly on the trad side, the tapered legs give it a modern, Scandi edge that's perfect for a traditional family kitchen. Hudson pair of dining chairs, £399, Heal's. Want to add a splash of colour to a traditional country kitchen? The ice cream shades of these Daisy dining chairs liven up a very traditional spindle back design. A country cottage must, these cuties are a snip at just £59 each, Littlewoods. Designing a Shaker style kitchen? These hoop-back chairs, which draw inspiration from the verandahs of New England are the perfect match. Grab a glass of iced tea and head out to that porch (or patio). Love a touch of Mid-century style? The Monty chair is a retro beauty elevated to rather regal heights by sumptuous velvet upholstery in a rich shade of midnight blue. Monty velvet chair, £325, Graham & Green. Obsessed with Mid-century interiors? These 1950s-inspired chairs, with their sculptural backrests and tapered legs, will allow you to live out your Mad Men fantasy in your dining room. Set of two Delilah dining chairs, £179.99, MY Furniture. If you have an eye for detail, you'll love the Washakie chair, which has a definite Native American flavour, with a dreamcatcher-inspired back. Available with either a linen or velvet seat, the Washakie will sit just as happily in a dining room, kitchen or in front of a desk. It costs £320, Oka. A velvet sofa has been on our lust list for a while now, but we think we might be moving on to velvet dining chairs. Possibly more of a throne than a humble chair, this eye-catching Pols Potten number should not be confined to the dining room. It ought to be free to stand proudly in the hallway, bedroom or as an extra seat in the living room. The entire thing - legs included - is upholstered in velvet, so whatever you do, show it off. Velvet Aunty Chair, £340, Amara. You don’t need to be Indian royalty to get your hands on the Maharani dining chair. Crafted from Sheesham wood solids, it’s riddled with charming irregularities – no two chairs are the same. An upholstered seat adds a little padding and boosts the comfort score. Maharani upholstered dining chair, £179, John Lewis. Looking to nip the budget in a bit? This chair is a true bargain. Made from solid pine, the Gambleby chair has been painted a goes-with-anything mid-grey. Make like the Scandis and adorn yours with a cosy sheepskin rug draped over the backrest. You can afford to go the whole hog with a set of six, since this pew is a steal. Gambleby dining chair, £35, Ikea. With grand backrests and generously roomy seats, never have dining chairs been so inviting as this Padstow button-back design. If you lack the space for a whole set, simply mix and match these beauties with Padstow spindle back chairs. The Padstow costs £469 for two, Furniture Village.